How do I wear my sash and how does the velcro work? Our pageant supports a great charity. What discount can you give us? I can't remember my password.? 1. The size of your order. Obviously, we can make 5 sashes more quickly than 500. 3. Our workload at the time you place your order has the greatest impact on delivery times. Under normal circumstances, orders are processed and shipped within 2-3 weeks. However, this is not a guarantee. If you need your order within 14 days, you must use Express Handling. We use USPS Priority Mail or USPS Express Mail as we deem appropriate. USPS has proven to be the most reliable option for shipping our products. However, we do not accept responsibility for shipping delays beyond our control. Universally, the center of the sash is centered over your right shoulder and wrapped around to your left hip area with the the sash flat against your body all the way around. The front of the sash (the half with the title) is then draped over the top of the back of the sash. Embroidered sashes include velcro, but Competition sashes do not. We use a special velcro that includes the hook and loop on all pieces. This makes the velcro far less likely to snag on the sash and/or whatever you are wearing. As such, we have selected a few charities to sponsor and cannot offer discounts to any others. We do, however, wish you the best of luck with your charity! At the top of the page, select "My Account" and then "Sign In". 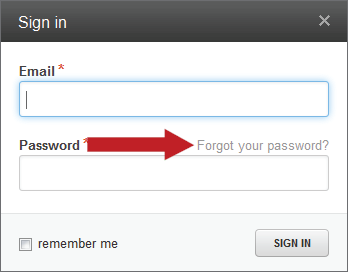 The sign in form includes a link to have your password reset. Follow the instructions and you will get a new password with which to log in.